Director Matthew Warchus has given Beckett&#146;s bleak 1957 comedy an even bleaker production. The world is coming to an end. Trapped in a strange room, the blind and bullying Hamm (Michael Gambon) and his shambling, hapless servant Clov (Lee Evans) pass the time toying with the hopelessness of their situations, deeply aware of the inevitability of their end. Their dialogue is punctuated by appearances by Hamm&#146;s parents, Nell (Liz Smith) and Nagg (Geoffrey Hutchings) who live in dustbins at one end of the room. Warcus sets the play within the vaudeville tradition which inspired Beckett&#146;s work. As the audience enters, a shabby patched red curtain fronts the stage and repeated laughter and tacky drum rolls are heard. The two large patches on the curtain neatly parallel the two high windows in the room which, as designed by Rob Howell, is truly grim and forbidding–an excellent metaphor for the hopelessness of the situation. Sadly the rhythm of vaudeville repartee is missing from the playing of Hamm and Clov&#146;sdialogue. Though the hopelessness and despair of their situation is all too apparent, the comic patter and therefore comic irony aren&#146;t. It is the parents (and in particular Liz Smith) who relish their lines and play them to the audience with true music hall bravura. Indeed, Liz Smith&#146;s performance is the only ray of sunshine in what is a relentlessly lugubrious evening. What appears to be missing from the interplay between Hamm and Clov is a sense of relationship. For (as in Shakespeare) the master and the servant need each other, even though Clov is hopelessly impractical and inefficient and Hamm is totally demanding and cruel. Similarly, Hamm&#146;s parents, confined to dustbins, need Hamm for food. Indeed in many ways, Hamm and Clov are the Lear and Fool of absurd drama. 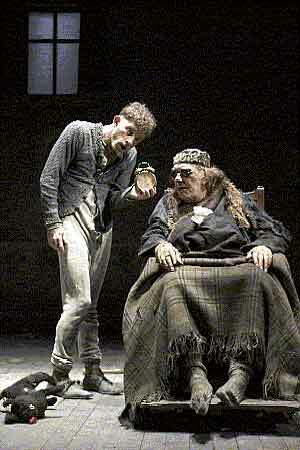 The play, like King Lear, is a comment on the despair within dependency. It is Hamm and Clov&#146;s need for each other which creates the pathos and the emotion within the play and to which the audience can relate. This crucial element is absent in Warchus’ production. Gambon effectively creates the Lear-esque elements in the role, railing against his blindness and his confinement to a wheelchair. Yet he misses the poetic opportunities in the text; his tirades lack vocal variety and his reminiscences, tenderness of tone. His performance is dependent mainly on the voice, since he is confined to the chair and wearing dark glasses. Gambon’s Anglo -Irish accent and hectoring tone make lines difficult to follow at times and the relentlessness of his delivery turns the role into a crashing bore. Lee Evans, a comedian famed for his plasticity of movement, turns his body into a powerful physical symbol of Clov&#146;s misshapen personality. His opening mime with a stepladder is a comic tour de force, but constant repetitions throughout the play make it tiresome in the end. However, Evans does communicate the frustration within Clov very effectively, though his dependency on Hamm doesn&#146;t really come through to the audience. Overall the dynamics of the production are rushed–moments in the dialogue and therefore the relationships are not allowed to tell. As Hamm says, "Nothing is funnier than unhappiness." This production disproves Beckett&#146;s point.